The German smart home market is booming and will triple its volume to reach 4.3 billion Euro by 2022. According to the study “The German Smart Home Market 2017-2022. Facts and Figures,” by eco – Association of the Internet Industry and Arthur D. Little, the average annual growth rate for the next five years will be 26.4 percent. The two market segments generating the highest revenues will be “Energy Management” (1.3 billion Euro) and “Lighting and Window Control” (1.2 billion Euro). The study examines a total of six segments – with these also including “Security and Access Control,” “Entertainment,” “Health and Assisted Living,” and “Household Appliances”. By 2022, smart home market penetration will have quadrupled from its current two million German households to around eight million. The growing and ever-broadening range of offers extends from window sensors to digital voice assistants and vacuum cleaner robots, right through to intelligent mirrors. Voice assistants facilitate the convenient control of smart home applications by means of natural speech. “Systems such as Alexa or Google Home combine artificial intelligence with advanced speech recognition, connected to household appliances like washing machines, refrigerators, or surveillance systems,” continues Summa. All of this ensures dynamic growth. 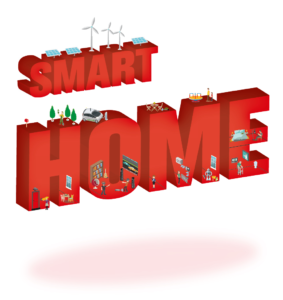 While classic major sectors of the German economy, such as electrical and mechanical engineering, were only able to grow by 0.5 to 6 percent annually between 2010 and 2015, the smart home market is expected to grow by 27 percent annually in the coming years. However, in order to exploit the huge market potential, companies must become part of a functioning ecosystem. Responsible parties should therefore be open to integration and collaboration with providers of solutions from other industries and technologies. As a recipe for success, the study identifies the functioning exchange of data and information between different manufacturers’ devices, as well as user-friendly smart home solutions. Riegel identifies a particular need to catch up in the area of smart software. “While numerous German companies manufacture excellent hardware products, the accompanying smart applications are often very limited and only partially user-friendly.” In order to rectify this situation, the study recommends that companies disclose information such as that of source codes, and thus exploit the innovative power of related industries and even of competitors. The Management Summary of the study is now available free of charge for all interested parties on request, by contacting members@eco.de. The complete study “The German Smart City Market 2017-2022. Facts and Figures” will be available shortly. eco members can receive a copy of the complete study free of charge, and non-members can purchase the complete study for €149, also by contacting members@eco.de.